John Isner and Nicholas Mahut, at 9:30 Eastern time, will take the court at the All England Club to resume the longest match in tennis history. So far, the two have played for 10 hours. Twice, the match has been suspended due to darkness. Isner and Mahut sit atop Wimbledon’s all-time aces list for a single match thanks to their record-breaking tennis tilt. The two are tied 59-59 in the fifth set of the match that will never end! The previous longest match in Grand Slam tennis history was a 6-hour, 33-minute affair at the French Open in 2004. Every minute, every serve, every ace breaks a record. 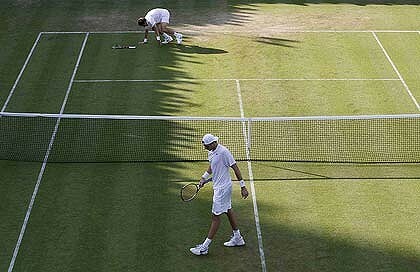 What American Isner and Frenchman Mahut have done on the court is a thing of mesmerizing beauty. I didn’t need another reason to love tennis, but watching these two just lay it all out, with Mahut surviving multiple match points and Isner soaking through his shirt with exertion has just been incredible. This match is why people love sports. It’s been epic in scale, yet incredibly personal. These guys are just going to keep fighting and keep playing, possibly forever. Win or lose, this is a once-in-a-generation display of toughness and guts.